Decide whether you’re comfortable letting this person donate for you. Give them the transplant center’s phone number, so they can make an appointment to begin testing and interviews. The UNOS Patient Services telephone line is not connected to your transplant center, and due to privacy laws, UNOS can’t look up your patient information and forward it to your transplant center. What if my donor lives in another state? Your donor may be able to get tested closer to their home. Call UNOS Patient Services at 888-894-6361 to get this process started. The transplant center will do many medical tests on your donor. The center will only let your donor donate if they don’t face major medical, mental, or financial risks from donating. What if I have a donor, but they aren’t a match or aren’t a great match? You may find someone willing to donate who isn’t a good match for you. This means there’s a strong chance your body will reject their donated kidney. There are some options you can do to make transplant more likely to work well for you. These options are called desensitization and paired and chain donations. About 1 in 3 kidney patients have extra antibodies that will attack almost any transplanted kidney. Antibodies are proteins in your blood that help your body fight disease. This can make it very hard or impossible to get a kidney transplant from a donor. A procedure called desensitization may help. In desensitization, you get a blood treatment that takes out your antibodies and replaces them with new ones. The treatment is similar to hemodialysis. Your body will make new antibodies over time, and these new antibodies are less likely to attack a donor kidney. You may also get medicine to stop the unwanted antibodies from coming back. Desensitization may not be available in all transplant centers and it can be very costly. Talk to your team about if this is an option for you or if they can recommend a center that offers this treatment. You have 2 kidney patients who need transplants: Mr. Jones and Mr. Smith. Each patient’s son wants to give him a transplant, but neither is a match for their father. The exchange lets each kidney patient get a matched kidney, while also allowing each son to help his father get a transplant. This is when 2 or more donor-recipient pairs match, but not as well as a doctor might like them to. 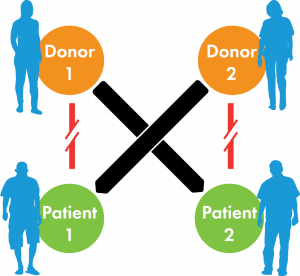 It works just like a paired exchange, but if it takes too long to find another donor-recipient pair, the donor can still give to their recipient. You have 3 kidney patients who need transplants: Mr. Jones, Mr. Smith, and Mr. Doe. Each patient’s wife wants to give him a transplant, but none of them are a match for their husband. The chain lets each kidney patient get a matched kidney, while also allowing each wife to help her husband get a transplant. Some chains have included over 30 patient and 30 recipients! In these 3 ways, a donor can help you and also help others who need a kidney transplant. Speak with your transplant center to see if they offer these programs. Who can do a paired or chain donation? Sometimes, people step forward to donate a kidney to someone they don’t know. A non-directed donor can help build a donor chain or a paired donation that wouldn’t be possible without them. What happens if a paired match is found? Even if tests find a possible match, there is no guarantee that the transplant will happen. Where does the paired or chain transplant take place? with you and ask if you want to accept a shipped kidney. Before you are paired, the matching system will take note of if you’re willing to travel. Your surgery will likely happen at the center where you did your testing. Transplant professionals will ship your kidney to the kidney patient’s center. Some patients may ask you to consider traveling to their center for the surgery to lower the chance of something going wrong while shipping the kidney. Before you are paired, the matching system will take note of if you’re willing to travel. Next: What is a living donor?